The FUN way for children to learn Bible stories! Your children will have fun while learning life-changing lessons from the Bible with our animated DVDs sold individually or in Home and Family Collections. Other exciting options include digital streaming via Amazon and Vimeo and our DVD Club, which offers an affordable means to provide our fun and thrilling adventures and Bible stories for your children each month! 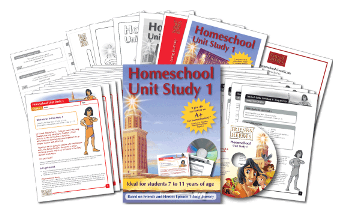 Visit our Homeschool Page where you can learn more, download free curriculum samples and view a video clip. Looking for curriculum for Bible only? We are excited to announce the upcoming release of our Homeschool Bible Study curriculum. The curriculum is scheduled for release in December and is available for pre-purchase on our webstore today!